One of the world’s largest manufacturers of smart card readers has launched an NFC reader with a built-in two line LCD display. 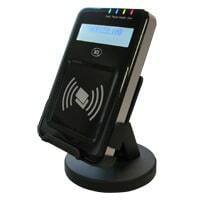 The ACR122L from Advanced Card Systems (ACS) builds on the success of its ACR122 series of contactless readers by offering users a visual guide to their transaction which the company says will provide a more intuitive, interactive experience. “As one of the pioneer developers of NFC readers, we are proud to add ACR122L to our line of contactless readers,” said Gilbert Leung, sales director at ACS. Last year the Hong Kong-based firm launched an NFC reader which incorporates a fingerprint sensor, enabling biometric identification and verification to be added to PC-based contactless and near field communication applications.